Science chief conferred with Doctor of Laws | The Department of Science and Technology (DOST) celebrates with DOST Secretary Fortunato T. de la Peña (middle) as the science chief was conferred with Doctor of Laws (Honoris causa) during the 21st Commencement Exercises of the University of the Philippines (UP) Mindanao in Davao City on 26 June 2018. The Doctor of Laws, which is the highest degree that the University can award to an outstanding individual, was conferred to Sec. de la Peña to recognize his utmost contributions in UP and his decades of service in DOST. Sec. de la Peña served as Director for the UP Institute for Small Scale Industries from 1992 to 2001 and as Vice President for Planning and Development for the entire UP System from 1993 to 1999. Prior to his current appointment as the DOST Secretary, he served as Undersecretary for the science agency under two administrations. The citation reads, "Under his leadership, the DOST has taken on ‘Science for the People' as its battle cry, actively seeking means by which science can best serve the needs and interests of the Filipino people and support the socio-economic development of all Filipinos, particularly those in the neediest regions." Sec. 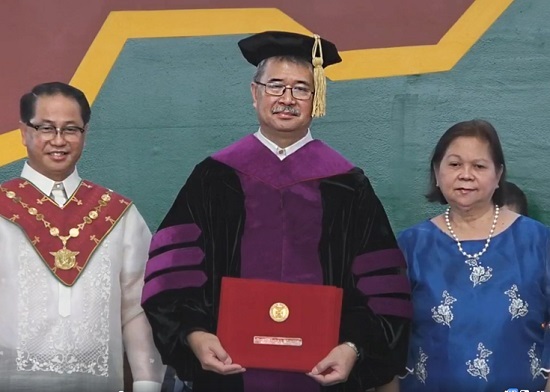 de la Peña is joined by his wife, Mariquit Banzon-de la Peña (right), together with UP President Danilo L. Concepcion (left) who is part of the committee of honorary degrees that recommended the conferment to the DOST Secretary. (Text by Jasmin Joyce P. Sevilla | Photo screengrabbed from the 21st Commencement Exercises live video https://www.facebook.com/UPMindanao/videos/2069541963118394/).